Prejudice is a terrible burden to live with when the world is changing, which makes the subject of this post somewhat more ironic than usual. As one of the more obsessional book collectors, I’ve grown up and persisted through the decades surrounded by physical books. I still have almost all the books and some of the comics of my childhood and teen years — an example of sentimentality triumphing over common sense. But the bulk of the collection has been sold off. It was a painful sacrifice, but the alternative was even more painful. In fact, I’ll be saying goodbye to the more recent acquisitions soon — probably early in the New Year. Such are the penalties of advancing age and changes in circumstances. In the midst of all this upheaval, I’ve been watching the technology of book production and content distribution evolve. I do my best to maintain neutrality, trying not to judge the merits of the new devices used for reading. Indeed, I’ve been induced to dip an experimental toe into the dark side. The fact my preferences run strongly against reading text digitally has not stood in the way of my self-appointed role as a reviewer. All too often, the book for review is made available to me in electronic format. I grit my teeth, download to my Mac and scan the screen. Old dog, new tricks and similar idioms leap to mind. Against this background, I note the arrival of Eclipse Online. The anthologies edited by Jonathan Strahan have been events to write into diaries, always hoping for, nay, expecting interesting results. Now we learn there are to be no more. The editor is moving with the times and transferring his endeavours online under the umbrella of Night Shade Books. All of which is explained in the first editorial which, in turn, signals the publication of the first story, “The Contrary Gardener” by Christopher Rowe, which you can read here. The irony I referred to flows from the nature of this first story which is rather cunningly apposite. Imagine a world in which a command economy dictates to the bean or corn cob exactly how much food or other fungibles shall be produced. Waste is not to be tolerated. Efficiency is everything. Although the discipline of the short story prevents any significant detail in the context, it’s also probably reasonable to assume a one-child policy or something equally draconian given that automation has been allowed to take over so many of the “ordinary” jobs like driving the buses. In such a world, overpopulation and unemployment would be a dangerously unstable combination. The point of the story is therefore for our heroine to find balance and harmony. Without being preachy, the author shows us that no-one would be better qualified to make such decisions than a master gardner. We’re concerned with the mechanics of production, nurturing new life and finding a way for it to prosper so it can grow up strong. Sometimes hard decisions and sacrifices have to be made. Indeed, a dramatic end of a lifetime’s work may be required. Or, perhaps, the ending of one way of life may be an opening to something new and different. After all, change is not inherently bad. In the right spirit, it can be the harbinger of good outcomes so long as adaptation to the new circumstances is willing. So while my belief in printed media will remain strong, the presence of Jonathan Strahan at the helm of Eclipse Online will probably mean the new stories will find their way into my reading schedule. Insert your own idioms about spotted predatory animals at this point. I often find I have my best ideas walking around the house wearing only my underwear. These usually involve my wife and various kitchen appliances. But if the mood is not on me to make beef cobbler or an apple pie, I think about what’s missing from the world. Very occasionally, I wonder about the market for magazines. There are as many possible models for magazines as there are people prepared to put their money into the venture of producing one. The only real criterion for success is whether they find enough people to pay the price and so cover their production costs. Few have the deep pockets and commitment to continue producing a magazine at a loss. Then there’s the question of time. Until they’re making enough to pay living costs, the editor(s) and other staff can’t give up their day jobs. It’s a hobby no matter how professional the resulting magazine. This additional constraint puts more pressure on the dedicated people. Over time, people get tired. The lack of financial success undermines motivation. The magazine withers away. Yet there’s no lack of people like this editorial team coming forward with their best hopes to the fore. As always, we welcome new warriors to the fray and wish them well. 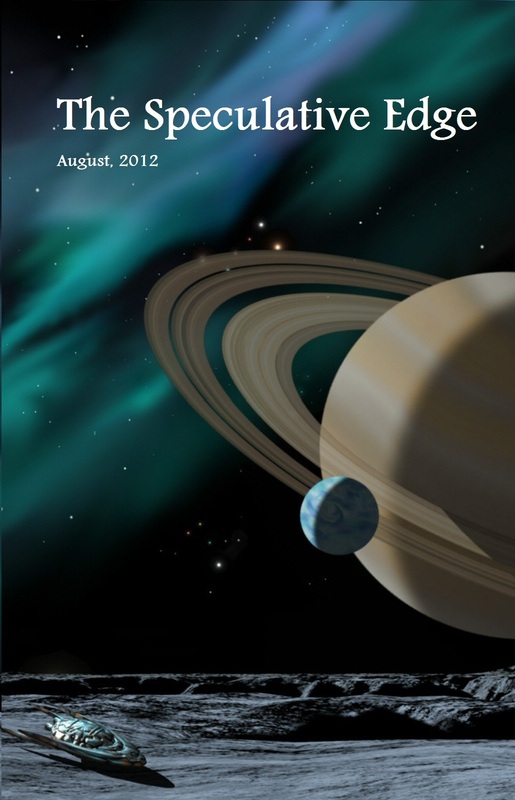 The Speculative Edge launches this August. In writing this review of the first issue, it’s not my job to make any kind of prediction as to whether the venture will be a success. That’s a judgement the market will make. My only task is to describe the concept and say a little about the content. As the title suggests, it features science fiction, fantasy and horror. 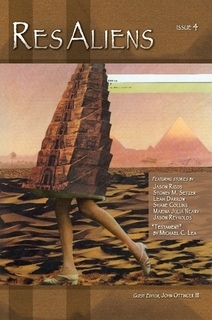 The issue has four elements: interviews with two new authors and excerpts from their work, four short stories (two of which are reprints), some poetry, and non-fiction with both reviews and a brief discussion of the relative merits of literary as opposed to genre fiction. There’s something refreshing about putting the spotlight on new authors. Too often magazines trot out interviews with the same headline authors. In part this gives the magazine a certain credibility. That Stephen King was prepared to vouchsafe ten minutes of his time impresses some potential buyers. It also goes with the flow and produces a self-fulfilling prophesy in the book trade about which authors in the magic circle will appear in self-promotional venues to reinforce their brand image, sell shed-loads of books, have their names on the NYT Bestseller List, and so on. I always try to give support and encouragement to the so-often-ignored midlist authors. In this case, we have two self-published authors. This is more of a risk for two reasons. First, there may be a very good reason why a publisher has not picked up the titles. And it can be an example of cronyism, i.e. the magazine gets a reputation for promoting the work of the editor’s friends. I’m all for bringing talent to the attention of the wider market. Having read the two excerpts, I’m not convinced either author is so spectacularly good to have been preferred over the several thousand midlist authors who are largely unknown to the mass market. This is not to say that the interviews are uninteresting or the fiction is bad. I simply find the editorial choice of these two authors slightly odd. Similarly, with thousands of perfectly competent people producing original short stories, it’s a little strange to find two of the four stories are reprints. Even allowing for the lack of payment for rights, there should be enough content of publishable quality coming through the electronic door with proper editorial standards being maintained over what appears in the final issue. That said, “The Cosmic Stringbusters” by D L Chance is a very good take on the social problems likely to be encountered in a generation starship. It elegantly questions whether the psychological pressures of the journey will be better faced by abandoning the past and only looking forward, or whether censorship of those things reminding people of the past would, in its own right, cause more problems than it would solve. “Of All the Gin Joints” by C T Hart is a nice joke about androids and the games they play. Except, if one android is following another based on an electronic signature, why does the switch work? “Gravity 101” by Christian Riley is a routine alien invasion story with somewhat judgmental aliens who decide they’ve had enough of us as a species and would rather we were no longer around, polluting the place and generally making too much noise. So, rather like teens, we’re to be grounded. “They Call Her Miss Hood” by Matthew Sideman is a fairy story reinvented as a noirish PI episode. It’s too long to sustain the conceit, but makes a brave shot at a difficult target. I regret to say I’m not competent to judge the quality of the poetry. Although I learned all about scansion at school and can read iambic pentameter aloud with flair, I’ve never actually been interested in verse of any kind so, regretfully, will pass over this section without comment. As to the reviews, the films selected are contemporary which is as it should be. The two books selected are The Hunger Games by Suzanne Collins (2008) and The Magicians by Lev Grossman (2009). No matter what the quality of the reviews, I’m not sure of the value to the readers in discussing books published three or four years ago. The essay at the end follows a well-worn path, but doesn’t really say anything new. When the word “edge” appears in the name of the magazine, I would hope for something more original and challenging. You only get a feel for a magazine when you can detect trends so this is a wait-and-see moment. Fortunately with The Speculative Edge, it won’t cost you much to find out how things develop. The subscription rates are low and represent good value for money — https://sites.google.com/site/thespeculativeedge/subscriptions. All I hope is that the editorial policies turn to original fiction, contemporary reviews (more of them and shorter might be better), and edgier articles and essays. Indeed, edgier all round would be good rather than the slightly “safe” middle-of-the-road feel to much of the first issue’s contents. So, all in all, this is worth a look and support. Hopefully it will grow in stature and join the ranks of the great magazines of the day. A copy of this magazine was sent to me for review. Well, here’s a novelty. I haven’t looked at a magazine for years (what with books being so fascinating and all). And this is one of these micro-press efforts that struggles valiantly to survive, needing every possible encouragement to get from one issue to the next. Having been in the small press game, I’m always prepared to give support to deserving causes. The name above the door is ResAliens guest-edited by John Ottinger III. This is Issue 4. So, here we’ve got two burning issues of the day. Given the micro-press world can’t afford to pay the cents-per-word demanded by the serious pros, the task of the editor is to find stories good enough from the ranks of the up-and-coming. Having sat in the position of resident critic to a new writers’ website, I know how great the struggle to persuade people they haven’t got what it takes. Only every now and again do you come across someone who not only has interesting ideas, but can capture them in readable prose and is prepared to accept editorial guidance. So, when you put up your shingle as a new magazine, how many of the stories offered make the grade? Second, even if the stories are good enough, the economics of the small publishing business are always hand-to-mouth. In hard copy, these magazines are selling for $8 plus shipping. The alternative is to buy a download from Lulu for $2. For whichever sum, you get 60 pages or so of fiction. Not allowing for sales tax which varies from state to state, the price for a new mass market paperback anthology or collection is likely to be between $6.99 and $8.99, so with more words, the paperback is potentially better value for money. We start off with “Fishing the Moons of Jupiter” by Jason Rizos. This is flirting with the old idea of capturing aliens to either solve a problem on Earth or as a drug for our entertainment. In this case, it’s a rock-eating worm that can help produce geothermal energy and so reduce the risk of global warming. Curious that, even in this future time, we still have oil — not over the Peak — and the Earth is apparently not too badly damaged by climate change — just goes to show that warming must be a myth. Anyway, my real objection to this story is the random approach to fishing for these “life-saving” worms. No-one in their right minds is going to spend this amount of money to send men that far without investing a few extra dollars in some systems for underground imaging. Real fishermen today use sonar*. This group of hunters could use technology based on temperature differentials since the worms give off heat, or identify oxygen molecules on the surface or, as with current mining and construction works, use ground-penetrating radar systems to map the tunnels and other voids. While the main body of the story is quite effective once the tunnel has been located, the ending is really strange as we are left uncertain whether this is real or a delusion induced by the head injury to our POV character. Shame really. With a little more thought, this could have been really good. “Overgrown” by Stoney M. Setzer is decidedly clunky. The opening desperately gives us exposition in a few words of conversation, closely followed by infodumps on Carla and Brady’s living arrangements. Anyway, here we remember The Day of the Triffids and Attack of the Killer Tomatoes as a magic fertiliser made from meteor dust gets plants moving. This is not to say that derivative stories can never be any good. But rather that, if you are recycling the plots of classic novels and B-movies, you’d better do it well. Sadly, this is not done well. “Immortals” by Leah Darrow adds a twist to immortality in that a woman dies if she has a child. This is an idea with great potential and, to some extent, it’s realised. There’s good technique on display in suggesting how society has developed rather than resorting to mere exposition — I particularly like the security guards for the cheese. But when we get to the nub of the plot, it pulls its punches. Emotionally, we are invited to see a woman’s desire for a child as unselfish. It may well have become socially unacceptable to die in this way — in a world where people may live for a thousand and more years, only those depressed by the endless passing of the years might choose to die — but her desire to live on through her child is left without a real context. We are told there’s a “tiny island state” where the Traditionalists live. Friends’ initial joy turns to what? How does the rest of society react? Would her pregnancy lead to her being ostracised and invited to join the Traditionalists? What discriminations might the child face when growing up surrounded by adults embarrassed by what he represents? What is the significance of this forty year period — is this a Logan’s Run cut-off when suicide is demanded? There are so many questions left unanswered. Nevertheless, this is a brave effort. We then end with a good run. “End of Eden” by Shane Collins is better written and creates a not-unlikely scenario in a post-apocalyptic world. It would have been improved if it had explained what caused the problem and where most of the people had gone. Starting off in medias res never works well for me. “Salieri: An Untold Story of Griffin and Kemp” by Marina Julia Neary is dedicated to H. G. Wells and is in a league of its own. Although it adapts the terminology of British life for US readers and is not really Wellsian in style, it’s a nicely judged story which elegantly captures the stifling quality of Victorian academic and professional life as one generation is groomed to succeed the next. “The King of Infinite Space” by Jason Reynolds is also a well-executed story, overcoming its lack of originality with real wit and style. While “Testament” by Michael C. Lea dabbles in a future academic research facility where the death of one in a delightfully confused love triangle may signal the end of contact with a world on the cusp of a major event that will resonate through its history and culture. So there you have it. Looking at the scores on the doors we have four hits, two brave shots, and one clear miss. Not bad for a micro-press magazine. There’s many a magazine or short anthology produced in the professional publishing world that would be grateful for such a record. Now here’s the rub. This is a set of stories that could have been genuinely excellent, but circumstances have conspired to leave things in this somewhat unsatisfactory state. Allowing for everyone’s taste being different, I can say the whole represents an interesting read but, for me, it’s not worth the money in hard copy (unless you think it’s going to be a collectible). At $2 in download form, however, this is a good buy. You know you should. We should all support up-and-coming micro-press magazines. One day, thanks to our support, they may become great. *My heartfelt thanks to Jason Rizos for pointing out my error — see the comments below.